Slightly modified Megane GT hatchback is actually the forthcoming RS. Upon first glance, it looks pretty much like the warm 202-hp Megane GT introduced last fall in Frankfurt, but check out the car’s rear end and you’ll notice some changes. There are dual exhaust tips mounted in the middle which indicate this is in fact the first sight of the range-topping RS version likely set to go on sale towards the end of next year as a 2018MY. The GT’s regular two exhaust pipes are still visible on this test mule’s diffuser, but most likely these are not actually connected to the car’s exhaust system. 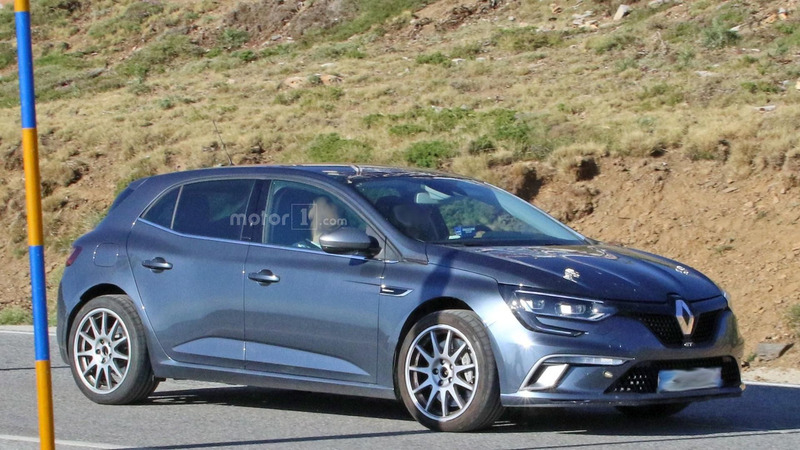 In addition, there’s something going on with the wheel arches and most likely the changes suggest Renault is working on wider tracks for the crown jewel of the Megane IV range. Some hood latches and Brembo brakes up front round off the visible changes on the outside, whereas the interior appears to carry some testing equipment. While the outgoing Megane RS is only available in coupe form, its successor will be sold exclusively as a more practical five-door hatchback. It will be interesting to see whether that rumor regarding an all-wheel-drive layout will pan out to fight the all-paw Ford Focus RS or Renault will decide to stick with the FWD setup. As for power, it’s too early to say what’s lurking under the hood, but our money is on an evolution of the turbocharged 2.0-liter four-cylinder unit. Right now it has 275 horsepower in the current Megane RS, but Renault’s engineers will probably fiddle with the engine to squeeze more power. As a matter of fact, a report indicates the new hot hatchback will offer more than 300 ponies to keep up with its Blue Oval nemesis. 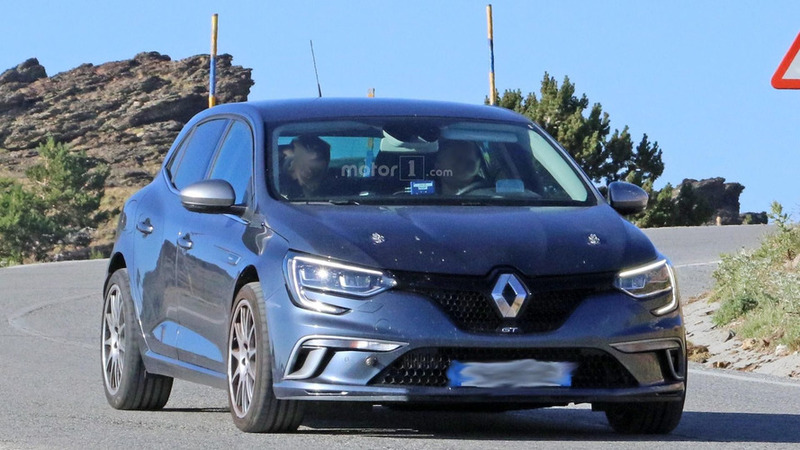 This test mule appears to have shift paddles behind the steering wheel, thus indicating the car was rocking Renault’s seven-speed, dual-clutch transmission from the aforementioned Megane GT. The EDC ‘box will most certainly be available, but what about an old-school manual? Well, sources close to the company with the diamond logo are indicating it could happen as a way to please purists, but we are not so sure about that. After all, the Clio RS doesn’t have a manual, so why should things be any different with the next Megane RS? Renault probably has plans for a reveal at a major auto show next year, so look for a public debut either in March at the Geneva Motor Show or in September in Frankfurt.